The West Jackson Fire Department Fire Prevention Bureau was established in November 2015. 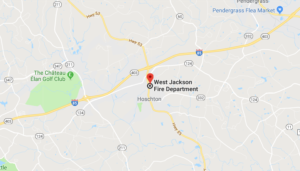 The West Jackson Fire Department is the authority having jurisdiction (AHJ) in these matters for all of the West Jackson Fire District. It is the mission of this Bureau to provide a fire safe community for our citizens and visitors. We maintain a proactive fire prevention program by inspecting all public buildings for potential risk during an emergency event. We believe that effective fire prevention begins with education. Therefore we place a high priority on educating our community on the importance and purpose of fire safety. We believe it is a team effort that benefits us all when we are successful in reaching our goal of making West Jackson a fire safe District. The Fire Prevention Bureau conducts all fire and life safety code enforcement activities through examination of building plans and on-site fire inspections. Fire inspectors are trained and certified through national certification processes to determine code violations and offer remedies to those violations. Fire and life safety codes are adopted mostly at the state level, although there are some local ordinances that are stricter than adopted state codes. Fire inspectors use these codes and ordinances to ensure that public buildings are safe when occupied, and, that should an emergency occur, occupants can safely escape without injury or death.